the devastating effects of climate change. climate grief, anxiety, loss, despair. It’s the Ides of March. I attend the School Strike 4 Climate in Sydney. My body propels me there. to join the throng of passionate youth. It is a privilege. I am moved. John Lennon’s Imagine plays over the sound system. Thousands sing along. Those who know the song best are the mainly older women supporting the mainly younger women who form the phalanx, the guts, the heart, the mass movement. How can I not cry, given the presence of considered, compassionate youthful force, coupled with That Song? Lucky I’m not the mother or grandmother of a self-conscious teen, as my river of tears pours down, down, into our damaged earth. My thirteen year old self would have said, ‘How embarrassing’, and shrunk behind a rock. However, self-consciousness doesn’t appear to dominate the scene. Amazing, inspiring young women such as Jean Hinchliffe, age fifteen, host the huge rally and speak with extraordinary clarity and strength. They are the sensible ones. They are the alert, proactive, reality-based ones. The old, right, white, male politicians? The new old Roman emperors who loll and bumble on their hot beds of greed, corruption and inaction? Or even take retrograde, destructive, willful action on a large scale? Do they care about the world, or not-world, they are leaving for their progeny? I won’t bang on. This is Art and Soul Space, after all. A place of light, but deep sharing of creative connection. See Jean’s TEDx talk here. Her talk begins after about 25 minutes of proceedings. but they are not too young to take action. See an article by Mary Robinson (ex-president of Ireland) here. Climate Change Denial is Evil. See Artists and Climate Change blog site here. And the thousands of young women and men, the school children? They are considerate and polite, as well as fierce. provided the most fun I’ve had in ages. The sort of fun that includes getting the giggles. Uncontrollably. Even if you are sixty. Let’s travel back to early January. Five of us arrive from far-flung corners of the country, meeting at a gorgeous Sydney harbour pool. There’s Jennie my sister, Ruby my twelve year old niece, Marg my friend and colleague and Tara her thirteen year old daughter. The swimming’s done. It’s time for art. We have watercolour Brilliants, waterbrushes, pens and five small pieces of paper. Shall we do a group project? Will it be a serious reflection on the year that was, or a visioning for the new year? No. We opt for non-serious. Tara suggests a paint-a-bit-and-pass-it-on process. You fold your page into five sections. You start with the head of a person, animal or hitherto undiscovered creature, then fold it over so it’s invisible. The next person, uses the reference marks you made to paint the neck and shoulders of a creature onto the next fold. And so on. into a tiny new world. My duty-brain has been knotted with nervy caregiver logistics. Sleep? Huh. A thing of the past. Dementia tangles and plaques its way into my daily surrounds, both in my personal and professional life. Are you a caregiver for an elderly relative? How does this sit in your soulscape? ‘Emotional labour’ is a term coined by Arlie Hochschild in her book ‘The Managed Heart’. I love those words. Emotional labour. Managed Heart. They speak to me. Emotional labor is the process of managing feelings and expressions to fulfill the emotional requirements of a job. More specifically, workers are expected to regulate their emotions during interactions with customers, co-workers and superiors. I feel my way into expanded meanings of emotional labour. Could it be all the invisible inner work of trying to make it OK for someone else? There’s the smiling, soothing, smoothing over, placating, reassuring, drawing forth strength, glossing over, smiling, facilitating sticky interactions, anticipating, planning, being one step ahead at any moment, smiling, refining, suppressing your own natural needs, mopping up messes and much much more. And smiling. Do you relate to this at all? I find respite in a sweet place by the sea. I hear the sounds of two beaches. An outdoor studio amongst the trees. Birdsong. Treats for the senses. Will it be a flower? I do like a fairy garden. There. I came out and said it. Does that make me twee? Not just any fairy garden. It has to be tongue-in-cheek, ideally with social meanings, a political message, or just a plain crazy-offbeat combination of miniatures. Gnomes are OK, as long as you’re aware of their inborn kitschness. I easily tune into brokenness these days. Loss, dying and dementia wrap around my personal and professional spheres. I notice and respond to the sorrows of those around me. I guess I have a negativity bias. Do you? They say it’s commonly human to focus in on the one negative thing in an armful, a roomful, a lifestyle-full of health, love and glitter. Yeah, well, didn’t the Buddha say, ‘Life is suffering’? And that it helps to be with it, look at it, breathe it in; not always run away, or always crave something better. But hey – the purpose of this blog is to cultivate creativity, and creativity isn’t just made of neat, fully-formed fairy wings. Creativity acknowledges the ‘slings and arrows of outrageous fortune’ (thank you, Billy Shakespeare). It fashions the mottled, the battered, the forgotten into something new and possibly sparkly. I chance upon a Gnome Home in my neighbourhood. I don’t care what anyone says…. Trees and people. And art. a small painting right there on the last wall of the Modern Masters from the Hermitage exhibition. It’s Odilon Redon’s Woman Asleep Beneath a Tree. The colours are vivid-heart-blue and blood-song-red. The texture is knobbly, gritty. linking the terrestrial and celestial realms’. Couldn’t have said it better myself. Trees. Ahhh. Large trees. Ahhh. I am ignited to consider images of humans in relation to trees. Sure, I’ve spontaneously painted Sally-style trees quite often. Yet, there’s something evocative, memory-sparking, dream-lifting, fairytale-diving, about a picture of a human adult or child making contact with a tree in some way. Lost and Found in the Forest. Then I recall my Resting in Abundance Tree. This bejewelled painting on calico was inspired – would you believe – by a Psychodrama Conference session on ancestors. During an ancestor meditation my imagination oddly leapt straight back to a big old tree, bypassing centuries of great and great-great relatives. Since creating that work, when I remember, I attempt to conjure the bliss of leaning back into the voluminous, solid trunk of a large mother tree. Some months ago, I stayed in an aesthetically displeasing cabin in the mountains. The one charming element was the broad beech tree overhanging the balcony. I gazed up into its intimate branches and swept into floods of tears at the cascading cognitive loss of a family member. I painted a wee picture: Deep Grief Beech Tree. The cushion she sits on becomes the Blue Mountains. The sheltering branches become an eye. She has just made the transition from primary to high school. That transition so many of us made in unguided horror in the old days, is well supported by her new school. On holiday from Melbourne, she climbed a massive fig tree – the type of tree some Sydneysiders take for granted. I love this photo. I might just have to do a painting of it. Marion Alexandre is a beautiful artist I found on Facebook. She does a lot of people-and-tree pictures. Let’s see – here’s a link: Marion Alexandre images. In Their Branches – Stories from ABC RN’s Trees Project. 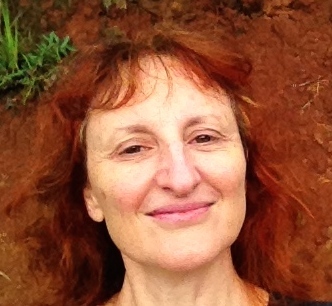 Gretchen Miller, editor, says, ‘In 2013, ABC RN asked its audience for stories of the trees they loved and the trees they had lost – and as director and curator of the project I was astonished by the volume of correspondence, and deeply moved by the unique nature of the very personal stories told.’ The book is a selection of the written snapshots sent in by the radio audience. More people-and-tree artworks are clearly required. I’ve never before noticed them. I haven’t been paying attention. I walk up the hill to the enchanted forest on my friend’s property. The knotted rope of my bodymind begins to untangle after a hectic time. A personalised mantra for the day emerges: My main job is to relax. I am momentarily freed from responsibilities of elder-care, both in my personal world and in my art therapy professional world. I relearn how to breathe. That is, I remind myself, it is safe to slow down and sigh. The world will not collapse because I’ve given myself permission to fully inhale and exhale. Geez. I must have been stressed. I walk up the hill. One bright yellow leaf stands out from the dark soil. It’s spotted. Kind of splotched, like a painting. Polka-dot gum leaves? I’ve never before noticed them. Could the dots be caused by disease? Are they a natural part of the ageing process? I am so ignorant about biology – about most ologies, really. this one is even heart-shaped. divine. The spots are unevenly, imperfectly placed. I find this beautiful. Don’t wise people talk about the perfection of imperfection? Well, here it is. I have a creative impulse. I will arrange these leaves somehow. Squiggly patterned and bi-coloured leaves join the flock. Not one of the leaves is perfect. They are scarred, torn, lop-sided. They are breaking down, beginning their ground-based decomposition after living the high life. I place them. I experiment. Leaf by leaf, dot by dot, they come together in new formations. Even old leaves can form new patterns. Even dying leaves, separated from their prime source of vitality and community, can express life. 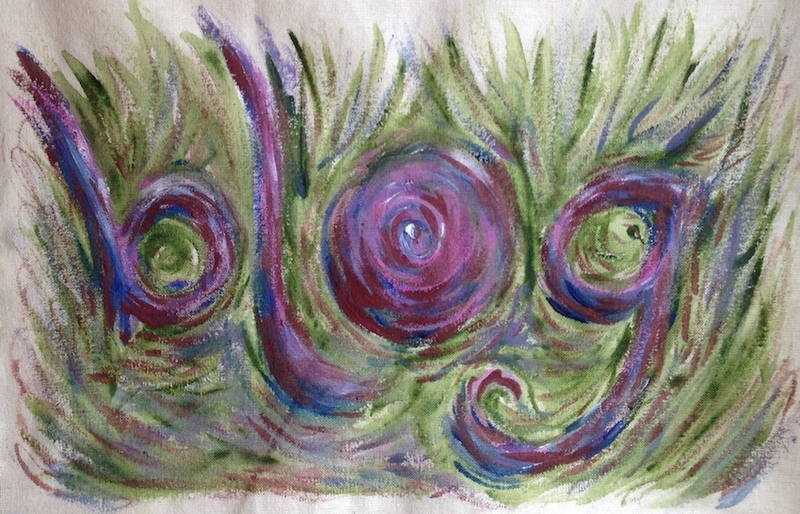 This is the nature of nature, of living-and-dying cycles, of art therapy in residential aged care. Is it any wonder the book I am working on is called ‘Leaf by Leaf’? about the perfection of imperfection. Let me tell you a story straight from the Creative Love Exchange. Some years ago I went to a Playback Theatre retreat in the Blue Mountains. I stayed in a little ex-train carriage in the bush. I couldn’t sleep. This is not unusual for me and my restless, anxious night-mind. I rose up, out of bed and walked away across the earth. It was a very not-city scene. There were trees and trees and crackly gum leaves underfoot. Careful, Sally, careful to not get lost wandering off the beaten track in the middle of the night. The thing is, I felt completely safe. The moon was full. I didn’t walk far into the thicket of things, yet was wrapped in beauty; surrounded by a cathedral of moon and tree. I returned to bed and slept. The next morning I saw a sign. Caution: Do Not Walk in the Bush at Night. Do Not Stray from the Track. Timid, urban, physically unadventurous me had done both those things, yet I felt safe. I created a picture: Lost and Found in the Forest. And…lo. Thirteen years later, an art therapy friend asks to purchase this painting for her sister who is turning sixty. At first I am unsure whether this work is for sale. Then I say Yes. I embrace the loop of giving and receiving. You experience something. You receive the benefits of making art from the experience. Astoundingly, someone else would like to give you something in order to receive the medicines of the art you’ve created. There is an exchange of heart, of art, of goods, of services. It’s win win win. In this case, several sisters club together to buy Lost and Found in the Forest. Apparently the girl in the picture resembles the twelve year old version of the birthday woman. I wait. The gift is presented. She loves it. Do you have any stories of the Creative Love Exchange? Of being in the flow of giving and receiving via creative expression? How to name this time of year? The season is Festive or a Holiday for some, but not for others. Do you say Happy Christmas to those in deep grief? Do you falalala about prickly green and red plants and ruddy-nosed caribou? How to communicate swift positive wishes to all, sundry, those who are traumatised; those who give no hoots? ‘We hold you’, say the trees. I return to a beachside place of the heart. It’s been a while. The cabins that I used to stay in, to the north of the village, are demolished, erased. The whole camping ground is gone. It’s as if it never existed. I weep salty tears by the salty sea. I walk and weep; walk and weep. Other, more current griefs surface and spill. The long, slow, gritty grief of caring for elderly folk, in both my personal and professional life, unexpectedly surges forth. The bittersaltysweet release of tears is required regularly, it seems.